When tasting our first spoonful of 30-Minute Potato Soup with Mushrooms Leeks & Quinoa, without uttering a single word, we began plating for photos! Without a drop of refined oil or special tricks of the trade thickening methods, we accomplished certain creaminess. And when your dairy-free recipe tastes this creamy, you’ve done something very right! The most accurate test for us when it comes to validation for a recipe is our leftover test. We put the remnants of our pot of soup into little glass containers and stack them up just so in the fridge for lunches, munches and even future dinners on the go. 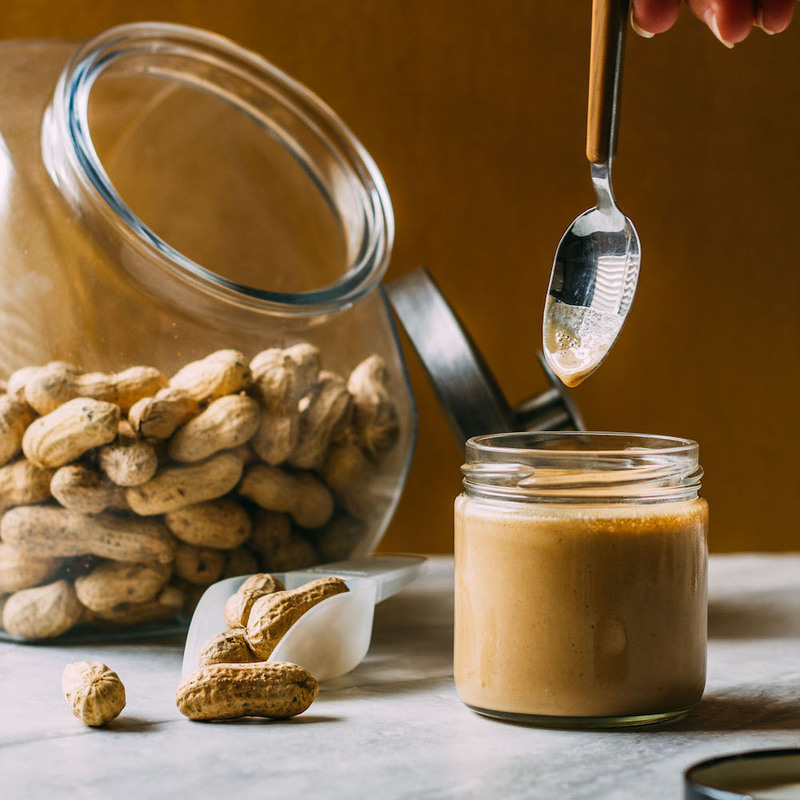 If the small glass jars disappear quickly, at near sound defying levels of speed, we know we’ve struck recipe gold. So into the fridge, it went. We put our 30-Minute Potato Soup with Mushrooms Leeks & Quinoa to the test! Ladies and gentlemen, the disappearing leftover test results speak volumes of praise for this recipe. Those little glass jars didn’t even manage to last a full day. One family member missed out entirely and felt remorse for not having staked their claim sooner. What’s that old saying? You snooze you lose, friend. 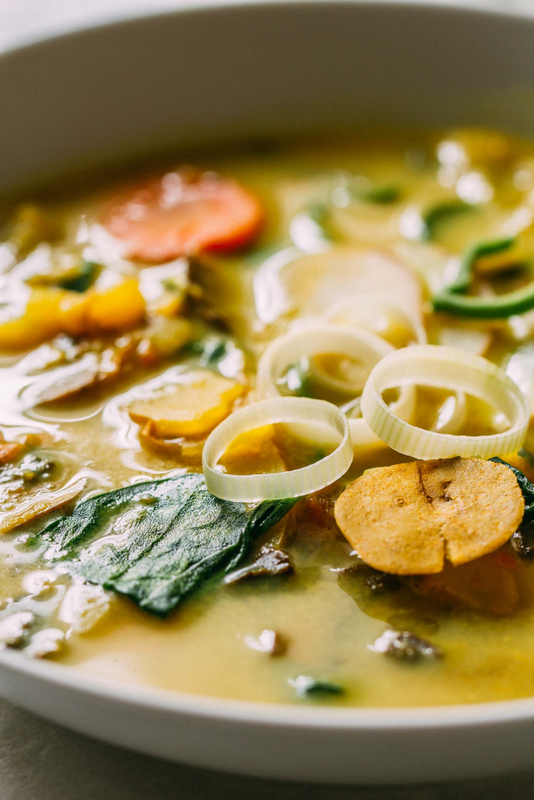 What Makes This Soup Taste So Good? First of all, this is a soup built on real whole foods rather than cornstarch, flour or other sorts of common soup thickeners. The base of this recipe consists entirely of leeks, carrots, celery, garlic, mushrooms, and potatoes! Herbs and spices elevate this dish without overpowering the wonderfully earthy base flavors. The inclusion of plant-based milk accomplishes creaminess without resorting to the use of less healthy ‘mouth-feel’ ingredients. In many creamy recipes, creaminess is gained though the addition of unhealthy refined oils. If we had to bring one recipe of ours to a soup cook-off, this recipe for 30-Minute Potato Soup with Mushrooms Leeks & Quinoa would be it. We’ve got nothing more to add to this recipe post other than the fact that we’re proud of this delicious combination of ingredients. 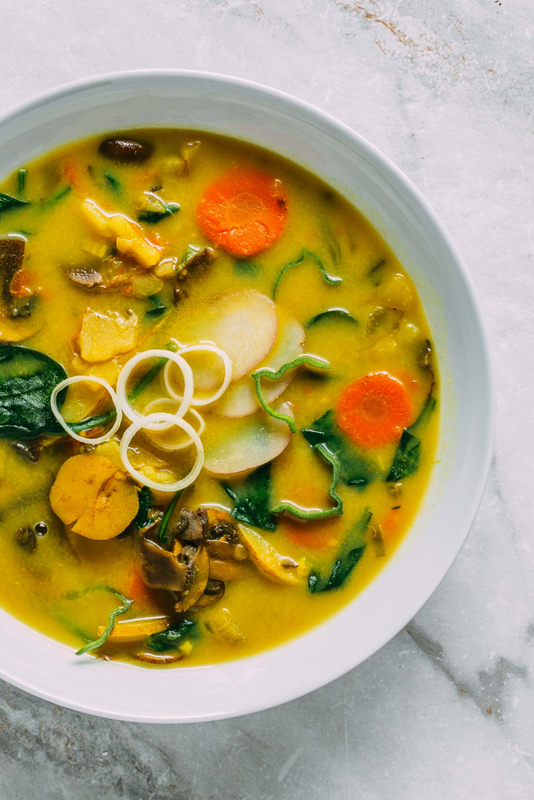 30-Minute Potato Soup with Mushrooms Leeks & Quinoa is a dish you can feel good about enjoying and sharing. So go, make deliciously creamy, flavorful soup! Enjoy it without guilt and share this recipe with everyone you like most! And if you’re looking for a fabulous tasting gluten-free bread to serve alongside this tasty bowl of goodness, we suggest the following. Try our Southern Style Stuffing Muffins or out delicious Gluten-Free Cornbread Muffins. Here’s a creamy potato soup recipe that gives a warm and friendly nod to a comfy cozy chowder. 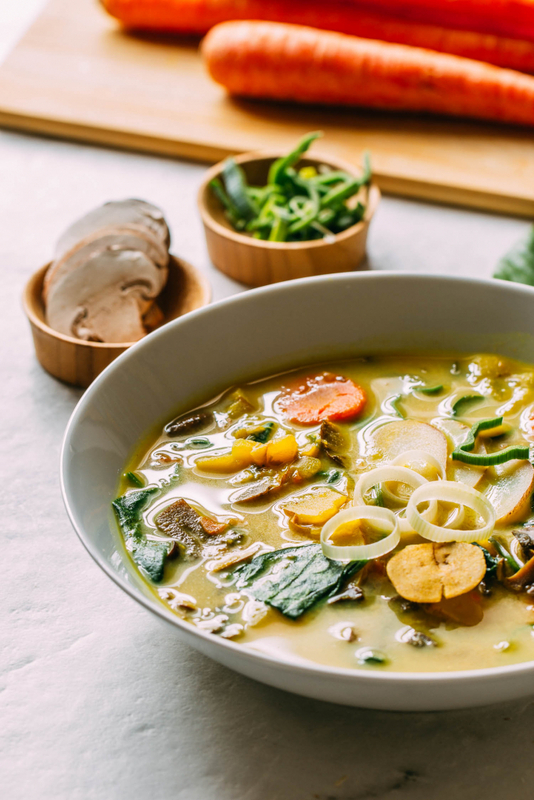 And in all respect and fairness to the other ingredients, this soup is so much more than another creamy potato soup or chowder. That being said, it’s deliciously rich and creamy in all of the right ways; and better still, it’s a quick and easy dish to make! 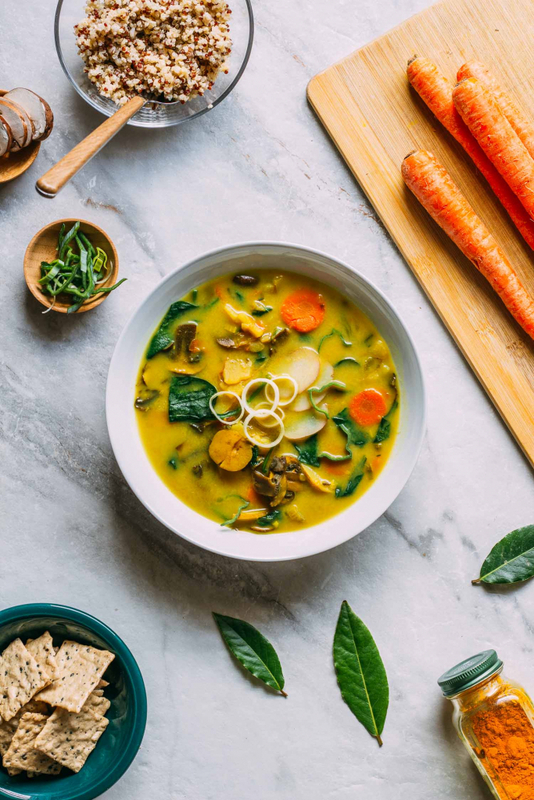 Made with whole food plant-based vegan ingredients that are incredibly nourishing, this soup will also go the distance to satisfy those cravings for something hearty without adding, unnecessary, unhealthy, and unwanted, fat. one generous cup of leeks rinsed well and chopped into strands and circles, crosswise, or use onion - Set aside a few pieces to use as a garnish. 6 or so cloves of fresh garlic, minced - You could use less garlic, by why? six sprigs or so of fresh thyme - A few more won't hurt, but don't skimp. If your using dried thyme leaves, see the comment in notes, below. 1 1/ 2 tsp of ground turmeric - This is a terrific bulk value for an organic variety of turmeric powder. a generous pinch or two of nutmeg - We used over a half of a teaspoon of nutmeg so use more or less according to preference. two fists full of baby spinach (about 2 cups) or a cup or two of broccoli, peas, kale, etc. an optional scoop of prepared quinoa or rice for serving, if you like - This is such a tasty way to use leftover rice or quinoa! For eight servings we used roughly three cups of prepared quinoa. If you don't have leftover quinoa or rice on hand, get a pot going according to package instructions. Then, preheat a large soup pot over medium heat. Add the leeks to the hot pan along with a splash of water and saute until translucent or for about 5 minutes. Next, stir in the carrots, celery and a pinch of sea salt and cook another 5 minutes or so until softened. Be sure to add splashes of water as needed during the sauteeing of the vegetables. Now add the garlic, bay leaf, thyme springs, ground mustard, and turmeric and give everything a quick stir. Add the mushrooms and cook another 5 minutes or so until the mushrooms have wilted. Stir in the potatoes and pour in the six cups of vegetable broth or water. Bring to a steady simmer, add another pinch of sea salt, reduce the heat to establish a lower and slower simmer and cover the soup with a lid. Cook for about 20 minutes or so or until the potato has cooked through. During this cooking time, be sure to check on the soup and stir now and then to assure nothing sticks or scorches. Once the potatoes are tender, stir in the nutmeg, taste and adjust the seasonings to preference, and stir in the fresh spinach. Cook for just another minute or so until the spinach wilts and remove the soup from the heat. Note that if you're adding broccoli or another vegetable, you’ll need to allow the soup to cook for a few minutes longer. 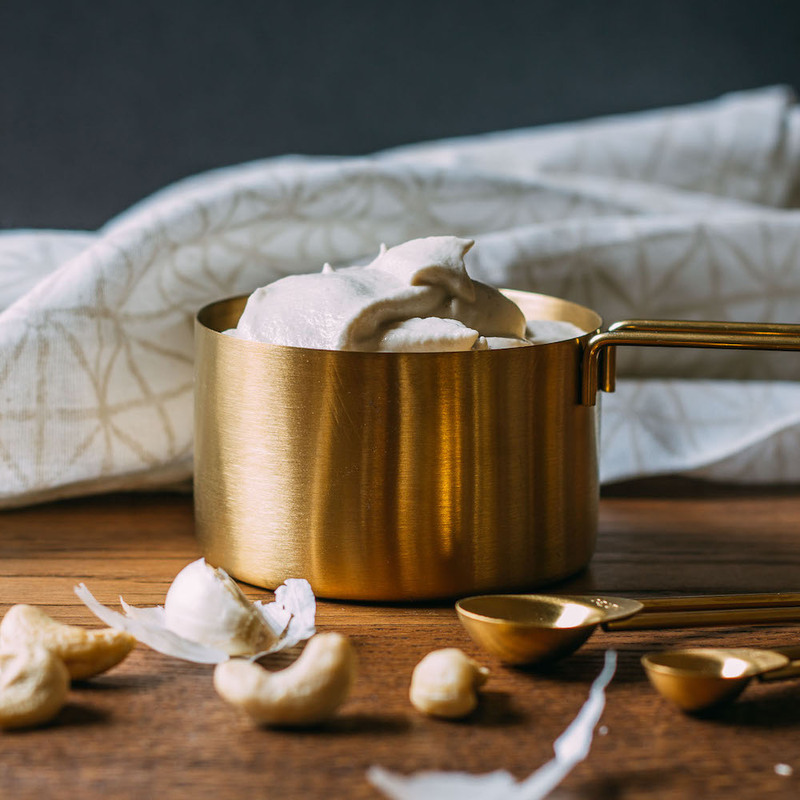 Now stir in the lite coconut milk or another plant-based milk of choice. Taste again and adjust if needed. Remove the thyme sprigs if you used fresh thyme. Serve immediately with a side of quinoa or rice to stir into the soup to create a hearty and satisfying meal. As another option, stir in just a drizzle of tahini for extra richness if you like. We sometimes add a tiny drizzle of tahini, but not always. Garnish each serving with an additional sprinkling of nutmeg, a round of freshly cracked black pepper, and a few pieces of leek. 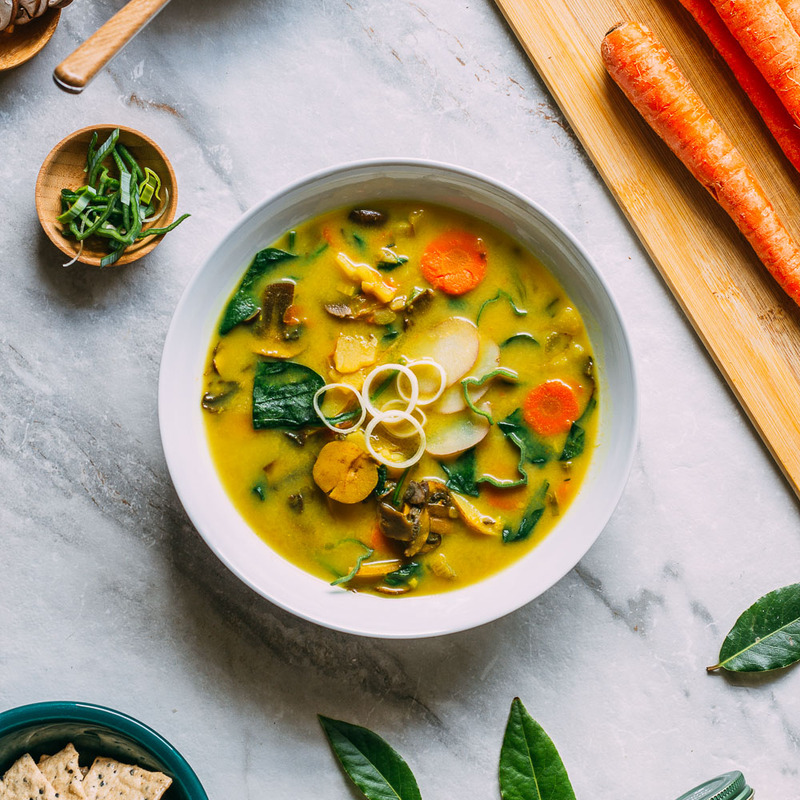 When you go ahead and slice each of the ingredients first, this soup comes together like a well-told story. Dried thyme may be used in place of the fresh thyme sprigs if you prefer. Start with one teaspoon on dried thyme leaves and add more after you give it a taste during cooking. By the way, if you find that you are working with spices that are not the freshest, you might want to increase amounts for more flavor as some herbs and spices lose their flavor while waiting to be used. You may opt to use green onions or another variety of onion instead of the leeks, but we urge you to try using leeks if possible. The flavor of a leek is gentle and buttery. Leeks offer a perfect supporting note of soothing, yet decidedly oniony, flavor. If using one of the alternative milk choices in place of the can of lite coconut milk, you may wish to warm it just a bit to bring it to room temperature before adding it to the soup. The only reason for the warming is to avoid making your hot soup cool down too much for serving. And if you're looking for a fabulous tasting gluten-free bread to serve alongside this tasty bowl of goodness, we suggest you try our Southern Style Stuffing Muffins or out delicious Gluten-Free Cornbread Muffins. Thank you, Karen – we wish we had known about these beauties sooner, but now that we do, well, may there be leeks in everything! I just made this, haven’t added the milk yet but the flavour is wonderful. Thanks for the recipe. I simmered it for quite a while and also pressed the potatoes so they were broken down. Mmmmmm.! It’s terrific to hear that this soup is working for you, Leslie! And thank you for being so kind as to share your delicious results. And thank you for sharing your method of breaking down the potatoes – it sounds delicious! So glad you enjoyed making this soup, Sarah. And thank you for your appreciation of the healthy ingredients, too. It’s a pleasure! And thank you for being here, for reading and showing support for our effort to provide delicious, doable plant-based recipes, Betty. Thank you for this recipe! Wild garlic season has just begun here in Hungary, so I have added a buch of it chopped to this wonderfully full-flavored soup. Sooo delicious!!! Wild garlic season sounds like it must be a fabulous time of the year! 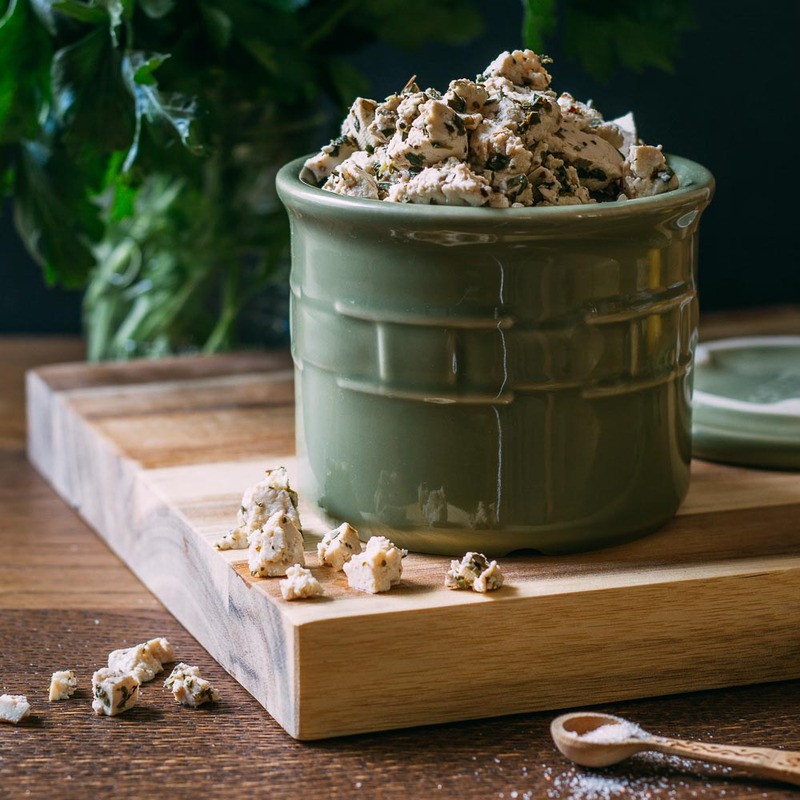 Thank you for reading, for trying this recipe and for sharing how you’re enjoying it – it means the world to us to know our flavor combinations and suggestions are appreciated.